Aviation Updates Philippines - National flag carrier, Philippine Airlines is now serving the Manila, Philippines - Nanning, China route twice weekly—Thursdays and Sundays. NEW CONNECTION TO CHINA. 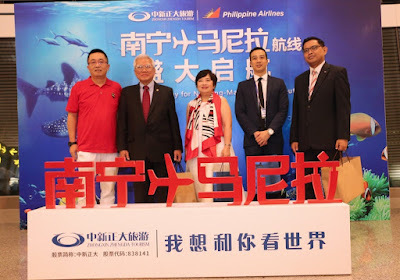 Philippine Airlines launched direct services between Manila and Nanning earlier this month. Photo by Philippine Airlines. A PAL delegation led by Special Assistant to the Chairman Emilio Yu and International Sales' Regional Manager for Greater China Sindy Lin flew from Manila to Nanning on board the 156-seater dual class Airbus A320 recently. The brand new flight departs Manila at 5:50 PM twice-a-week and arrives Nanning at 9:00 PM on the same day; return flight leaves Nanning at 10:00 PM and touches down in Manila at 12:55 AM the following day. Among the special guests who welcomed the flight in China were Philippine Consul General Marshall Louis Alferez and members of the Chinese travel and trade community. The 4-Star Carrier's other routes to China are: Manila to Beijing, Guangzhou (Canton), Hong Kong, Macau, Quanzhou (Jinjiang), Shanghai and Xiamen. More regional flights are in the pipeline within the year: the Manila - Chitose, Japan and Puerto Princesa - Peking, China services.